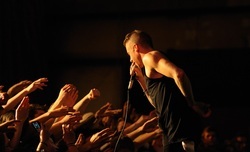 Here is a link to Vashon-Maury Beachcomber about our Macklemore & Ryan Lewis show. The Island is buzzing about a concert that will take place this weekend at Open Space for Arts & Community, featuring a Seattle hip-hop artist who just completed a major tour to venues throughout the United States. Opening acts for the famous rapper will feature more than a dozen talented Island teens. The show is part of “Sharing the Stage,” a concert series organized by Islanders Rob Bordner, Fred Strong and Harris Levinson, that aims to foster a mentoring experience for professional musicians and also give young Island musicians the experience of a lifetime. But Bordner said word about the concert is quickly spreading, and he hopes people of all ages will show up in droves, not only to see the main act but also to enjoy the talents of the opening acts. These include Blueberry Frousting, a band comprised of Noah Baseleon Abbott, Dylan Basurto, Dylan Greene, Brooks Benner, Tanner Montague, Aidan Morrison and James Spencer; Pensive Apocalypse, a trio made up of Kellan Faker Boyle, Max Westerman and James Spencer; the duo act of Madeleine Wolczko and Julia Hanowell; and Peter Evans, a rapper and producer who will also perform with Wolczko. Evans is eager to perform on the same stage with a hip-hop star he said has influenced his own work. “It’s definitely a huge opportunity for me to let another rapper see what I can do,” he said. Evans said that when he first heard about the show on April 1, he thought it was a joke. He added that he was grateful to Bordner, Strong and Levinson for putting on the show. “It’s incredible what they’re doing,” he said. But according to Bordner, a lot of other people also deserve credit for the concert. “I see a lot of kids stepping forward to do things they wouldn’t have had an opportunity to do otherwise,” he said, noting that teens and their parents are involved in all aspects of production, including sound and lights, concessions, promotions and security. Bordner, who runs a Seattle research and consulting firm, said that he is enjoying his sideline as a concert promoter — and that he’s out to prove something. “We can do bigger shows on the Island that the kids will really be engaged in.” he said. Last year, “Sharing the Stage” debuted with a show by the Seattle band, Visqueen, with youth as opening acts. The show was an experience that Rachel Flotard, the lead singer for Visqueen, described as a career highlight. “Sharing the Stage” will take place at 8 p.m. Saturday, May 7, at Open Space for Arts & Community. Doors open at 7:30 p.m. The show is for all ages, with a no drugs, no alcohol and no refunds policy. Tickets are $15 for students and $25 for adults. Sponsorships are available for $50 and $100. Contact rbornder@gmail.com.